When you run a query, by default the results are displayed as a preview in Detail View. You may review the results and then discard them or (for some types of queries) you may want to store the results in your project. When you run a query, by default, the results are displayed in Detail View as a preview. You can explore and interact with the results of a query when it is displayed as a preview. For example, you might run a Text Search query to find all references to the word balance. When the results are displayed in Detail View you can explore the references and click on the Word Tree tab to understand the contexts in which the word appears. After you have explored the results in Detail View, you can decide whether or not you want to save them. You may have no need to save the results—if you do not save them, they are discarded when you close the Detail View window. The preview results of Text Search, Coding, Compound, Matrix and Crosstab queries can be converted into project items and stored in your project, for more information, refer to Understand the Query Results folder. You cannot store the results of Word Frequency queries, Coding Comparison queries or Group queries. If you want to share your results with others or work with them in another application, you can export the results of queries from the preview in Detail View. When you save query results as a node or node matrix, the default location is the Query Results folder—a good place to keep result nodes until you decide that you want to add them to your node hierarchy. If you delete or update project items that are included in saved query results—the results are updated to reflect the changes. If you add new items that match the query criteria they are not automatically included in the results. To make sure that your query results accurately reflect the current state of your project, it is best to run the query again. You cannot change the content coded to a node when it is in the Query Results folder, because it represents the results of the query at the time you ran it. You can open the node and review the references. You can select content in the node to annotate, link or 'code-on' to other nodes. However, if you want to code additional content to the node, spread coding to surrounding content, or uncode some of the references, you will need to copy the node into your Nodes folder. You can copy a node from the Query Results folder to your Nodes folder at any time—once it is in your Nodes folder you can work with it in the same way that you work with any other node. 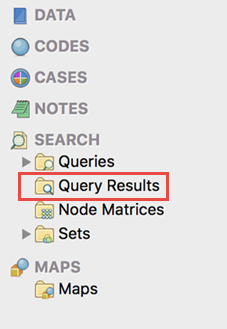 If you delete (or move) the node from the Query Results folder, you will not be able to view the query that generated it. When you store nodes in the Query Results folder, their content is fixed—it is a snapshot representing the results of the query at the time you ran it. This means you cannot code additional content to the node or uncode any references that you decide are not relevant. You can copy the node into your Nodes or Cases folder at any time if you want to bring it into your node hierarchy and be able to code and uncode node references. NOTE If you delete or move the node from the Query Results folder, you will not be able to view the query that generated it.